This book is completely unofficial and in no way endorsed by Games Workshop Limited. The Chaos devices, the Chaos logo, Citadel, Citadel Device, the Double-Headed/Imperial Eagle device, 'Eavy Metal, Forge World, Games Workshop, Games Workshop logo, Golden Demon, Great Unclean One, the Hammer of Sigmar logo, Horned Rat logo, Keeper of Secrets, Khemri, Khorne, Lord of Change, Nurgle, Skaven, the Skaven symbol devices, Slaanesh, Tomb Kings, Trio of Warriors, Twin Tailed Comet Logo, Tzeentch, Warhammer, Warhammer Online, Warhammer World logo, White Dwarf, the White Dwarf logo, and all associated marks, names, races, race insignia, characters, vehicles, locations, units, illustrations and images from the Warhammer world are either ®, TM and/or © Copyright Games Workshop Ltd 2000-2012, variably registered in the UK and other countries around the world. Used without permission. No challenge to their status intended. All Rights Reserved to their respective owners. The Warhammer rulebook contains the rules you need to fight battles with your Citadel miniatures in the war-torn world on Warhammer. Every army has its own Army Book that works with these rules and allows you to turn your collection of miniatures into an organized force, ready for battle. 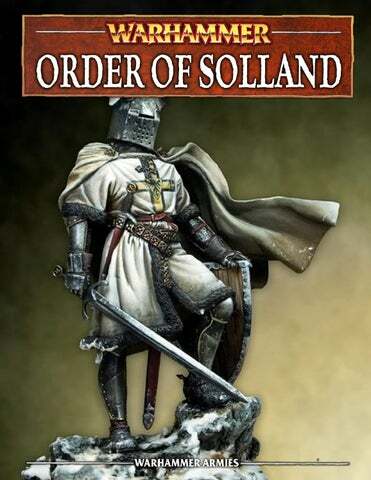 This particular Army book details everything you need to know about the Order of Solland, and allows you to field their armies in your games of Warhammer. This section (is still under construction) introduces the people of Solland. It includes their history with the Empire, their eventual destruction, and the rise of the Order of Solland. The Order of Solland Bestiary Every character and troop type in the Order army is examined in this section. Firstly, you will find a description of the unit, outlining its place in the army. Secondly, you will find complete rules for the unit and details of any unique powers they possess or specialist equipment they carry into battle. Also included are the rules for Terror Magic, as well as Black Monk warcrys, along with all of the Order's special characters. Why Collect The Order? This book describes in detail the troops that march to battle when the armies of The Order go to war. An Order army makes use of heavily armed units as well as devastating cavalry. Soldiers from different areas of the old world form the bulk of the army, knights ride down all those who oppose them, crusaders march upon far away lands, and the monks roar out their awe-inspiring warcrys. Leading these troops are none other than the four Hochmeisters, who charge into battles worthy of tale and song. Order Armylist The army list takes all of the warriors and creatures presented in the Order Bestiary and arrange them so that you can choose a force for your games. The army list separates them into Lords, Heroes, Core, Special and Rare units. Each unit type has a points value to help you pit your force against an opponent in a fair match. This section includes the Vault of The Order, magic items that you can give to your characters. TIMELINE 1707 – The Battle of Solland’s Crown: the last count of Solland, Eldred, is killed in battle by Gorbad Ironclaw. The few surviving knights in his retinue flee to Altdorf. 2244 – Knights from Pfeildorf lay waste to the countryside of Verezzo after a failed crusade. They establish the Fortress of Venitzia to maintain a permanent presence there. 1712 – The surviving knights fight in the siege of Altdorf and only four knights survive. Hugo Shnieder, Gerath Eastwald, Yarrik von Esterkal, and Erik Jünger. 2257 – The Knights of Tyra invade northern Estalia and burn the city of Graus to the ground, They form an order castle (El doro) in Azuara. This begins the expansion of the order in Estalia. 1730 – The knights dedicate themselves to passing on the ideals of Solland. 2301 – The great war against chaos sweeps into the Empire. Almost one thousand knights ride to the aid of Kislev and help the Empire break the army of Asvar kul. 1782 – The four knights Travel to Pfeildorf and Establish the Order's Headquarters. 1830 – Erik Jünger, last of the four, rides off at an incredibly old age. He is never seen again. 18401875 – The Order grows in number as surviving Sollanders flock to Pfeildorf. At this time the order is headed by a council of knights. 2006 – A small troop of the order ride to the aid of Bretonnia. They battle alongside the knights of Repanse de Lyonesse and are granted land in both Brionne and Montfort. 2050 – Knights of the Order ride to aid Altdorf against Vlad von Carstein. 2325 – Knights are sent to aid the Kislevites in defending against incursions from Chaos warriors and Beastmen. 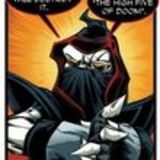 The leader of the knights, Darak-kal (also known as Darak the Dark) becomes corrupted goes on a rampage throughout Kislev, the Baersonlings, and even parts of the Empire. He is defeated at the Battle of Galicia where a massive army of skaven annihilates his force. Darak-kal escaped and began to train a new army in the border princedoms. 2350 – A Crusade is launched on distant Cathey but ends in disaster. On it’s sail home the crusaders are lost in a storm and are never seen again. It is rumored that they crashed somewhere in the new world or perhaps Albion. 2429 – The Order allows mages to join its ranks. 2067 – The Castle of Nagrifal in Montfort is sacked by Orcs. The Fortress of Tyra in Brionne demands to be made independent. 2099 – Greth Ultigen is appointed the first Hochmeister of the Order. He allows Tyra to elect their own Großkomptur to govern the province. 2456 – The Order locates Darak-kal and sends an army against him. The resulting conflict sees Darak the Dark killed. The Greatest Knights of the Order adopt the horned helms of Darak’s forces. 2467 – The Order is reformed to have a Hochmiester for each human nation. 2100 – Greth leads members of the order in battle against Konrad von Carstein. 2495 – The garrison at Fortress Venitzia is overwhelmed by Miragliano and the fort is ruined. 2132 – Greth leads the knights in battle alongside the empire forces against Manfred von Carstein. He elects the next Hochmeister before leading his personal retinue to join the battle at Hel Fenn in 2145. 2504 – An army is sent to Fortress Venitzia under Hochmiester Marcus to reclaim it for the order. Verezzo is subjugated again and the Tilean sect of the order is reestablished. 2232 – Estalia invades Brionne, the Britonnian order is hard pressed to defend Fortress Tyra. 2521 – The Storm of Chaos: The entire order is marshaled once again to ride out and confront the armies of the Everchosen. The Orcs had come. It had been only a matter of time. The minor Waaagh! of Grutsnuk Da Blind had been shattered in a bloody battle around Blackfire Pass. However the army of Averland had not been able to prevent a sizable splinter from burning a path through the outlying villages before striking into Western Wissenland. The news of the approaching horde had reached the village of Soldiken but still gave them little time to prepare. Hans stared at the encroaching horde of Orcs from behind the crude wooden palisade that had been reinforced around the village. He hefted a woodsman’s axe and noted how the other village defenders were too all armed with makeshift weapons that in reality would do little to the horde. A number of villagers had fled as soon as the news had arrived, but all knew that the roads this time of the year were just as much a death sentence than remaining in the village. A runner had also been sent out towards Pfeildorf, but chances were that he hadn’t made it or that the fabled knights of Solland wouldn’t arrive in time. As the Orcish horde drew closer, Hans found himself imagining the Orcs as being one green wave of destruction. His village and hundreds of others would be swept away by the tide of Orcs, as no matter how hard man fought, they could not defeat such primal destruction. The chanting of the Orcs had risen as they swarmed closer, in fact to Hans it seemed like the horde had one voice, not many. He tightened the grip on his axe and prepared for death. The sound of a horn piercing the air startled Hans that he almost dropped his axe. The rest of the villagers had begun to cheer, and Hans diverted his gaze to see a force of knights had appeared on the horizon. They began to gallop at speed towards the roiling tide of Orcs, and their banners were unfurled showing the colours of Solland. Dark armoured knights wearing frightening helmets led the charge; they were flanked by other knights in gleaming armour, some of whom looked barely into their teens. At the head of the force was a fearsome knight who held aloft a sword that gleamed with unearthly power. The wave of Orcs had turned away from the village to face this new threat, and to Hans they seemed almost numberless. The knights of Solland did not even pause to consider this as the drove full ahead into the waiting maw of the splinter Waaagh! The knights of Solland lowered their lances as they closed the last few hundred metres. A loud cry of “For Solland!” could be heard as the met the green wave, a line of silver in the autumn sun. The wave broke. In this section you will find information and rules for all of the different warriors, heroes, creatures and war machines in the Order army. At the end of the section are some special characters – famous men of the Order of Solland that you can field in your army. Before it's inevitable destruction, Solland had possessed one of the strongest military’s of the empire. File upon file of state troops had marched out against Solland's many enemies and almost always they returned battered yet triumphant in the field. After the fall of Solland and the formation of the Order, things changed dramatically. No more were seen the ranks of state troops or the thundering cannons and mortars. The Order's forces, vastly diminished in size, now rely on local recruitment in to bolster their ranks. An Order crusade can comprise of a few soldiers or many hundreds of different sects, each with its own marshal. Pikemen from Bretonnia, crossbows from Tilea, macemen of Estalia, and even the slowly rebuilding sword brethren of Solland all march in tandem against their foes. The elite crusaders are sometimes joined by either fiery zealots or humble pilgrims. Leading these men are the Großkompters, second only to their regional Hochmeister, who are assisted by cadres of veteran crusaders, war-mages, and deafening black monks. Perhaps the most well known of the Order are it's knights. From the lowly Jüngerbruder, apprentices at war, to the steadfast Halbrüder, their loyal teachers, these knights bring the wrath of Solland down on all those who threaten her. But perhaps the most fabled of these knights is the dreaded Ritterbrüder. Riding on dark steeds these almost supernatural warriors fight with the strength of twenty men and the horned helms they wear inspire fear in even the most brave of men. On the following pages are the complete rules for the models in the Order army. Each entry includes the models profile and special rules. This is normally in combination with the army list on pages 27-41 to create a force that can be used in a one-off game in Warhammer. However, players can also design scenarios with specific forces involved, or run a series of games in a campaign, both of which may well use the information in this section without recourse to the Order army list. Special Rules Many troop types have special rules to reflect their unique nature and abilities, and these are explained in the individual Bestiary entries that follow. To save space and repetition, where a model has a special rule that is explained in the Warhammer rulebook, only the name of the rule is given in this section. Refer to the special rules section of Warhammer for the full details of how the rule works. Similarly, the following rules apply to most units in this Bestiary, and as such are detailed here: Wave of Steel and Iron: Over hundreds of years the soldiers of the order have become some of the most disciplined armies to march across the old world. However in battle the heavily armored foot soldiers crash in a tide of iron against their foes. Models with this rule in the front rank of a horde formation inflict1 impact hit at their base strength value +1 when they charge. Mounted models inflict a hit for both the rider and the mount. Full Plate Armor: These all-enclosing suits of armor are crafted by Order master smiths and are kept in high honor by the Order provinces in their personal collections. These suits of armor are very rare, but undoubtedly offer the best protection available to warriors of the Order Army. Full Plate Armor confers a 4+ armor save to its wearer. Horned Dark Helms: Cursed by the foul taint of Darak's betrayal, the orders most powerful knights ride to war wearing horned helms designed to taunt the forces of chaos and inspire fear in all who look upon them. Any unit charged by a model with this rule must take a leadership test in the same way as if they were charged by a model causing terror Crusaders/Sollanders: While most of Sollands pitiful remains march among the orders ranks, there are those who preferred an attempt at new lives. These farmers, craftsmen, and militia are not part of the crusading forces in most cases. However should the need be great or the cause just these men will take up arms and go to war along with their brothers in armor. Any unit you take with the "Crusader" trait allows you to take a single "Sollander" unit of equal or less models. Sollander units may not be fielded otherwise. In addition, All units that do not have the Sollander trait do not have to take panic tests caused by units that have the Sollander Trait. Großkompters and Marshals Since the time of the founding of the Order the highest rank officers of the Hochmeisters are the Großkompter. They lead the armies into battle wherever they may go. However the position of Großkompter is not simply one of military command. It is a title of lordship and stewardship over part of the Hochmeisters lands. The Großkompter is expected to watch over and care for those he has sworn to lead. He acts as the judge, jury, and executioner for all civil disputes within his jurisdiction. This has of course led to some problems when unwise, unlawful, or plain cruel Großkompter either abused their power or simply could not keep their subjects in line. The hope, of course, is that each Hochmeister keeps a close eye on his Großkompter so that they are kept in check and not allowed to destroy the lands of the Order. However in one famous episode a Großkompter attempted to claim that as lord of the lands the Hochmeister had given his power up to him. this was rectified when almost two-hundred knights galloped into the castle and proceeded to drag the helpless Komptur by ropes from Bretonnia to Estalia. Of course the true might of the Großkompter has been in war. They command sizable forces of both knights and supporting troops. Rarely a Großkompter will be able to command a force of the dreaded RitterBrüder but it has been a common sight to see household guards consisting of nothing less than the dreaded black knights. With the power of the heavy knights, crusaders of righteousness, and hundreds if not thousands of Imperial conscripts, there is nothing that will not be crushed under the Großkompters leadership. Under the Großkompter serve a cadre of men known as the Marshals. These men are small land owners among the Order who command lesser forces of crusaders. When the time comes for the Order to march the Großkompters call upon their Marshals to rally what men they can to the gathering point. Normally each marshal can only bring a few dozen men but once together the army can be anywhere from a few hundred to several thousand in the case of a full call to arms. Like the Großkompter, Marshals are great commanders in battle, as well as more than capable fighters. War-Mages and Dark Mages Mages are outcasts from the colleges of magic having delved into darker arts in attempts to increase their personal power. Some went to work as mercenaries for varies factions in the old world. Some went on trips to far away Ind or Cathey to learn more. Yet more were hunted down by witch hunters of the Empire. To this day most are considered a blight on civilized peoples and some have bounties greater than rouge princes. The Order did not have the ability to call upon the colleges of magic to join them, nor did they want to rely on mercenaries to fill their lack of magic support. So the Hochmeisters came up with a plan to indoctrinate mages into their ranks by offering a clean slate. Needless to say the effect was instantaneous and mages flocked to join the Orders ranks for a degree of protection and freedom. This did not go unnoticed by the witch hunters. The Witch hunters and their assorted minions demanded that the Odrer hand over all their indoctrinated mages. When the Order refused one of the greatest battles in the orders history erupted in the year 2439. The Orders headquarters in Pheildorf was almost burned to the ground and the garrison was hard pressed. The day was saved when the Orders mages unleashed a wave of horrifying power, driving off the inquisitors. Gnawing Fear (Lore Attribute) fear comes in many ways, sometimes quickly in a rush of adrenalin other times slowly in that you can run. Those that use the Lore of Terror know that the best fear is that which takes you unexpectedly, freezing you cold and sucking the hope from your body. If a spell from the Lore of Terror is successfully cast on an enemy unit, that unit suffers -1 to their leadership until the start of the casters next Magic phase. This effect may only occur once per unit. 4. THE SOULLESS GAZE Cast on a 12+ The magician shoots black fire from his eyes. The soulless gaze is a direct damage spell. Place the flame template with the small end touching the wizard. the wizard may elect to try and boost the flames range by throwing an artillery die and moving the template that many inches straight forwards, however if a misfire is rolled the flames backfire and only the wizard is hit. Any model hit suffers a Strength 5 hit that has multiple wounds (d3). the wizard may choose to have the spell ignore ward saves and inflict d6 wounds instead. If he does so the casting value is increased to 21+. 1. THE NIGHT SHROUDS Cast on a 7+ The mage immerses his allies in a shroud of night making them almost invisible to their foes. The Night Shrouds is an augment spell with a range of 12” a target friendly unit gains a 5+ ward save against shooting attacks, the wizard may choose to have this spell affect every unit within 12”. If he does so the casting value is increased to 14+. Remains in Play. 5. THE CONSUMING GATE Cast on a 14+ The wizard opens a rift in the plane of the nether making his foes flee in terror of the consuming energy. The Consuming Gate is a direct damage spell. Place a large blast template within 12” of the wizard. Any unit touched by the template suffer 1d6+3 Strength 2 hits with no armor saves allowed, in addition the unit must take a panic test. The wizard may choose to make the spell inflict 2d6+6 Strength 2 hits and have the panic test taken with a -1 modifier. If he does so the casting value is increased to 21+. 2. THE ABYSS SINGS Cast on a 7+ The castor opens a portal into the realm of chaos. Sounds that no man can withstand taunt his enemies and force their nerves to strain… The Abyss Sings is a magic missile spell with a range of 12” and causes 2d6 Strength 2 hits with no armor saves allowed. The Wizard may choose to extend the range of this spell to 24” if he does so the casting value is increased to 10+ 3. THE BLACK CURSE Cast on a 9+ The Wizard saps the courage and will of his opponents making them less eager to fight The Black Curse is a hex spell with a range of 18” the unit is reduced in either S, Ld, or WS by d3 to a minimum of 1. The Wizard may choose to have the spell effect all 3 stats instead. If he does so the casting value is increased to 18+. Remains in Play. 6. THE DARKNESS DEVOURES Cast on a 15+ The mage calls forth the darkness to fully consume his foes in shear terror, making them collapse in hopeless spasms. The Darkness Devours is a direct damage spell with a range of 12” that may only target infantry. roll 6d6 and subtract the result by the targets leadership stat. The units suffers this many wounds with no armor saves allowed. The wizard may choose to extend the range of this spell to 24” instead. If he does so the casting value is increased to 20+. Special Rules: Wave of Steel and Iron Blessing of the Abyss: Any unit joined by a Black monk gains the Devastating charge Special rule. Prayers of Darkness: Black Monks know the five prayers of darkness listed below. Prayers of Darkness are innate bound spells (power level 3). They may be cast on any friendly unit within 12” these effects last until the casters next magic phase •For Solland! The unit gains +1 leadership •I've got your back! A character in the same unit and in a challenge may choose to transfer each of his wounds suffered on a 2+ to the monk, this must be done before rolling any saves. Warcry: At the beginning of the players turn the monk may shout a horrible war cry to encourage his fellow soldiers to battle. The warcry affects an allied Infantry unit within 12" of the monk. On a 2+ the warcry is heard and the unit gains +1 to their movement. on a 1 the unit has not heard or misheard the order and it simply makes loud noise. The cry lasts until the beginning of the next player turn. if any enemy unit is within 12" of the monk the cry is only heard on a 5+ as the battle begins to overpower his shouting. Multiple Monks may not use warcry on the same unit. Those who choose crusading over the path of knighthood tend to end up being killed in foreign lands and many who don't die tend to stop crusading after watching their friends die on unknown soil. There are those, however, who actually like the thrill of crusading. While the crusades were devised as a means to punish failing the trials of the Ritterbr端der, they were also meant as one of the primary means of income for the Order. Plunder is by no small means an encouraging benefit to those who leave on this missions. Some men are just exceptional fighters who have stayed alive in both failed and successful crusades to become quite wealthy. At first the Order wished to condemn these men. Repeat crusaders were seen as an abuse of the system and costing the Order money. But after the siege of Lohai in Cathey, where three crusader champions charging into a breach in the wall changed what was a mass route into a charge that baffled and confounded the defenders, the Order had a change of heart. The Order now allows these Elite crusaders to continue their quests for riches. While the plunder they take for themselves is not unsubstantial, the amount of successful crusades has risen overall, and so both The Order as a whole, and these Elites, profit. The Elite: Crusader champions may never join units. Order Soldiers The Order does not make use of the standard state troops like the rest of the Empire. Without a large core of able bodied men to recruit from the best the Order can hope to do is make the most of those that they have. So instead they have a smaller, but more heavily armored, core of men. Trained to move quickly while encumbered by the mail, these men can cross the distance in the same time that a more lightly armored troop could. And when the battle lines meet, the soldiers charge in a thundering rush towards their foe. The crash of metal against flesh leads to many enemies simply being trampled underfoot and crushed by steel encased feet. Those who are still standing are cut down by halbards or simply turn to run. Soldiers are taught never to fall, for if they do, the metal encased war machine of the Order will not stop. Special Rules: Crusaders Pike: Pikes are very long spears, almost twice as long as a normal spear and longer even than a horseman's lance. Pikes require two hands and fight in 3 Extra Ranks. Enemy models charging a unit of Pikemen to their front are subject to the Always Strikes Last special rule in the first round of close combat. Models armed with pikes receive a +1 Strength bonus in the Close Combat phase of the turn they are charged by anything except infantry, swarms and unique units. Note that this bonus only applies to attacks directed against the above charging units, not against other models that might be part of the unit. All of these special rules cannot be used against enemy units fighting to the Pikemen's flank or rear. Special Rules: Crusaders, Wave of Steel and Iron Mace: maces are hand weapons with the armor piercing rule. Zealots are pilgrims who, upon seeing the devastation of their homelands, have taken up arms against the enemies of the empire. while not quite the mindless fanatics that flagellants are, zealots still have a fiery determination to return all the pain and suffering bestowed upon them by their foes. An Order crusade can usually count on being followed by a core of Zealots eager for battle and bloodshed. But should the fighting turn south it is not uncommon for the spirit of vengeance to leave these men and see them run to the hills like like sheep from a wolf. Still, a wise commander remembers the uses of Zealots and they are still a welcome sight on the battlefield. Special Rules: Sollanders Righteous fury: A model with Righteous Fury has the frenzy, hatred, and stubborn special rules. However after a unit with righteous fury's first round of combat, the unit must take a leadership test on their own leadership at the end of every turn (yours and your opponents), if failed, they lose all the effects of righteous fury. Special Rules: Sollanders, Scouts, Hatred (Vampire Counts) Cover of Darkness: A model with Cover of Darkness is always considered to be at long range when being targeted by a ranged attack. Pilgrims of Pfeildorf Even after its sack, there are those men of Solland who wish to return to Pfeildorf in order to rebuild and resettle the land. While the city has long since been rebuilt many Sollanders travel the roads leading to and from it. These men trail in the wake of great crusades both for a degree of protection and a sense of unity with the men of the Order. If a battle occurs it is not uncommon for these men to help the Order, though they tend to run at the first sign of defeat. This mutual understanding has lead to the Order taking greater part in the protection of Pfeildorfs roadways, sometimes even sending armored parties to clear out the bandits. These actions have helped increase the overall safety of Solland and have succeeded in building up the local economy. Pfeildorf is a steadily regrowing city, but like all cities it begins to have problems. Crime is rampant in the streets as smuggling and racketeering have taking deep root. Those Sollanders who have a will join up with the cities guard in an attempt to curb the brigands down to a manageable size. These men serve a second use as well, should the city come under siege they are the first line of defense against whatever should attack. They may not be as unyielding as the professional soldiers or as stubborn as the proud knights of the Order, but when called to defend their homes these men go the extra mile to drive their spears in the enemies flesh. Since it's rebuilding Pfeildorf has been well protected and these men are proud to carry it's colors into battle. Special Rules: Sollanders Stalwart: Guardsmen of Pfeildorf automatically rally at the start of each players turn. If it its the controlling players turn when they rally you may move them as normal but may not declare a charge. Special Rules: Sollanders Unyielding: Infantrymen count their rank bonus twice for combat resolution. A unit with 2 ranks (including the first) would have a rank bonus of 2, a unit of 3 ranks would have 4. This bonus caps out at 6. Special Rules: Crusaders Pavise: The Pavise is a large heavy shield that grants a 5+ to armor save against missiles, but due to the unwieldy size is unusable in combat. this save can only be gained a turn the unit has not moved unless they pass a leadership test. Crusaders The knights who fail the trial of four or who do not succeed in training a pupil are sent on crusades to bring in treasure for the order. If they return with enough to please the order they are allowed to return to the knightly ranks and try again. surprisingly enough, most of these knights don't wish to continue their training, preferring the riches and excitement of crusading. Special Rules: Crusaders, Wave of Steel and Iron, Immune to psychology, Hatred (Araby, Tomb Kings, Nippon, Cathey, Ind, Lizardmen, and Amazons) Cathey long sword: these elegant blades allow for greater swordsmanship. Grants +1 WS, +1I and +1S. Nippon Kami Shrines: The small carry able shrines confer a blessing to the holder, grants a 6+ ward save. Indish Silks: Fine silks allow for greater haste to be made, +1M Lustrian Artifacts: The gold makes men fight vigorously, the model gains frenzy. Araby Incense: Inhaled deeply the incense inspires supreme confidence, the model gains unbreakable. Special Rules: Siege Engine: A Siege Trebuchet uses the rules for stone throwers with these exceptions. It has a large blast and is strength 10 multiple wounds D6 under the hole. In addition, should you hit a building with the center on a 15 any unit inside takes 3d6 strength 5 hits. on a roll of a 6 the building is destroyed and any units inside will take 5d6 strength 5 hits. JüngerBruder To become a member of the RitterBrüder one must advance through the ranks of the sword brethren. If they catch the eye of a HalBrüder then they become his Jünger Bruder or “younger brother” . The HalBrüder teaches his pupil everything he knows, the history of the order, the way of the knight, the mastery of war, and the way to install fear. In battle these knights are encouraged to run forwards and defeat a foe of worth. This helps prove their abilities for advancement. While JungerBruders are still amongst the better trained of Sollands might they are still impetuous and suffer from a lack of common sense. This is required for the transformation into the fearless and terrifying Ritterbrüder but it leads to high casualty rates. At the battle of Zvorak the Jungerbrudder galloped far ahead of the supporting infantry and encountered Border pikemen and longbows. Combined with the bad weather making the field a muddy disaster the knights were butchered to a man and only a small few survived to warn the oncoming Order to turn back and regroup. Hal-Brüder After passing the Trial of four, the Jüngerbruder are made Halbrüder or “half-brothers” These knights are a match for most of the knightly orders of the Empire and Bretonnia. They are the second stage of the Orders knights. When they have successfully trained a pupil they are given the chance to become a Ritterbrüder. Some refuse the honor as its a life oath. Most choose the chance to become one of the fabled dark knights. Until then they ride out where needed and are the majority of the Orders cavalry forces. 20 Crusader, Horned Dark Helms. Ritterbrüder The final stage of the Orders knights is the Terrifying RitterBrüder. Originally it was tradition in Solland's royalty for their oldest sons to be sent off to learn amongst the fabled dark knights and when Solland fell only a single RitterBrüder remained out of what was once possibly a thousand. This RitterBrüder, named Gerath, was one of the founding members of the Order of Solland and he worked diligently to rebuild it's primary knightly Order. When he died he had succeeded in training no less than ten men into a new generation of the RitterBrüder. Centuries past and the RitterBrüder became strong once again. The Vampire wars in Which The Order played a part of where instrumental in generating a real challenge to could uphold the standards of quality the RitterBrüder set for themselves. As the First great war against Chaos erupted, The RitterBrüder road side by side with Kislev's Bear Cavalry and the Empires Reiksguard at the Siege of Kislev, and together the armies of Asvar Kul are defeated. The aftermath of that war began an event with many names, Kislev calls it the 'Orders Betrayal', the Order calls it 'Darak's Betrayal' and the RitterBrüder call it the 'Beginning of the end'. Darak-kal, A RitterBrüder, was requested to aid the Kislevites in restoring peace to a war-torn nation. At first Darak lead his men with honor. But after uncovering an axe of chaos which possessed with a spirit of the earth, Darak claimed this Terralith and began to slaughter in the lands he had so recently saved. After devastating the Kislevites, The Norse, and even northern lands of the Empire, A skaven army from Hell-pit managed to defeat Darak. For the longest of time, Darak hid in the Borderlands, gaining power he planned to gather a new army and continue his campaign of death. Special Rules: Wave of Steel and Iron, Fear, Devastating Charge, Crusader, Horned Dark Helms. Special Rules: Wave of Steel and Iron, Terror, Stubborn, Hatred (undead) Ares (Fly, Terror, Large Target) The Sword of Gerath and the Armor of the Hochmiester: The sword of the greatest knight in the order and dwarven forged plate enchanted with runes these tools grant Greth the Killing Blow special rule as well as a 5+ wardsave and a 4+ armor save The Holy Shield: Taken long ago in crusade against Araby, the holy shield belonged to Eldrad the last count of Solland, after his death his shield was recovered and placed with other artifacts in the orders holds. Greth was the only one to use it in battle and it was shattered whilst fighting Konrad. The holy shield grants +2 to Greths armor save. In addition, if Greth should be killed the shield shatters and he ignores the wound and any others suffered and for the rest of the phase. Special Rules: Stubborn, Wave of Steel and Iron, Onyx:(Fly, Terror, Large Target, Breathe Fire [S4], Scaly Skin [3+]) The Dark Betrayer: Darak must be the armies general, in addition, any order army may not use the following units; Pikemen of Tyra, Arbalists of Venitzia, Macemen of El-Doro, Sword Brethren of Solland, Archer militia, Solland Zealots, Pilgrims of Pfeildorf, Guardsmen of Pfeildorf, Solland Infantry, Night Rangers and no other named characters. However Demontiert Ritterbrüder are now 1+ and a core unit and Ritterbrüder are now specials with 0-2 choice Butcher: Darak slaughtered countless persons on his rampage. most would like revenge. Darak-kal has the Hatred rule and all units in his army gain hatred, in addition, Empire, Order of Solland, Kisliev, Norse, Chaos (deamons, warriors, dwarves, beastmen), Dwarves, Skaven, and Orcs & Goblins all hate Darak and his army. Darak-kal was descendant of a great noble family in the empire. He joined the order at a young age and eventually entered into the ranks of the fabled Ritterbrüder. when the great storm of chaos erupted Darak was in the forefront of the armies charging the chaos lines at Kisliev. Darak was left behind with a unit of knights to help Kisliev defend herself from further intrusions. The Kislievits gave him any land he freed from the marauding forces of evil and so land he acquired. massive amounts of open country and forests. However his constant victories lead him only to seek more conquest and so he lead his men north into the Norse-lands and later the chaos wastes. It was here he found the great axe known as the Terralith. a behemoth with a blade almost more like a halberd. The power of chaos within the axe corrupted Darak and when he returned to Kisliev he began systematically slaughtering everything in his path. He rampaged through the Empire, the Norse-lands, dwarf holds, Kisliev, goblin strongholds and more. He captured and tamed the Black Dragon Onyx and with it rode to war for many decades. however an army of numberless skaven from Hellpit finally stopped his army and he fled to the border princes. there he spent many centuries trying to build up a force again but was finally rooted out and slain by the order. His dark helm and those of his followers are now worn by the Ritterbrüder in remembrance of this betrayal. The Terralith: Darak didn't start out evil. but with the power of the Terralith flowing through him he was unstoppable when he became so. The Terralith grants Darak +2 strength. no armor saves may be taken against wound suffered from the Terralith and each wound is multiplied by d3. Darak's Horrifying helm: +1 to Darak's armor save, Darak’s helm causes Terror, in addition, any unit charged by Darak must take their terror test at -2 leadership. Units that are immune to psychology take a terror test as well but do not suffer the leadership penalty. Undead units charged by the wearer crumble as per the rules in their rulebook. Chaos Armor: The chaos armor grants Darak a 4+ save, in addition it grants him a 4+ ward save. Special Rules: Wave of Steel and Iron, Unbreakable (he may only pass this on to a unit of crusaders), Erebus: Erebus is a true claymore. over 5 feet long and serrated with barbs and spikes, the weapon is more blunt than blade. However because of sacred enchantments it cuts threw protective magics. Erebus is a great weapon, in addition, any successful ward save made by a model wounded by Erebus must be rerolled. Lord of Crusaders: Willhelm has the Inspire rule as a Crusader Champion. however this rule is extended to all friendly models within 6"In addition, Crusaders within this area are stubborn. In addition, If Willhelm must be the armies general. His army gains hatred of the following armies: Araby, Tomb Kings, Nippon, Cathey, Ind, Lizardmen, and Amazons. these armies also hate Willhelm's army as well as fear Willhelm. Despised:For all his glory and riches, Willhelm is shunned by all true knights of the order. As Willhelm failed the trial of the RitterBr端der and never returned to test his faith again, the sacred knights truly hate and despise him. If Willhelm is in the army no RitterBr端der of any type (this includes dismounted and Fliegen) may be taken as well. Marius, Patriarch of Pfeildorf Marius, while not a member of the order originally, was a priest located in the rebuilding city of Pfeildorf. He lived his life in peace and harmony until the faithful day an orc Waaagh was spotted less than a weeks travel from the struggling community. As the city began an evacuation Marius began to work. he spent hours in the forge smelting iron and hammering at steel until he had fashioned for himself a crude set of armor. Taking up a farmers scythe he began to preach to the men of the city, speaking of the bravery of men and the city itself. Slowly but surely a band of followers crowded around him, until before long he had no less than half the city roaring at his sermons. He gave the common man hope and even managed to convince the mayor to requisition aid rather than flee. As the orc horde approached Marius and the people of Pfeildorf manned the walls with every ranged devise they could muster, and as the sea of green crashed into the walls the men held for three weeks before being forced to retreat into the city itself. Bitter street fighting erupted and people could not run for fear of slipping on the blood washed pavement. Marius himself rallied men at his church and there they held the line on top of a wooden cart. But just as the men prepared to make a final stand horns were heard and the Order of Solland entered the city through secret ways only they knew of. The bewildered orcs, caught between the citizens of the city and the heavily armored foot knights were all but annihilated. Special Rules: Marius was offered a position of high Marshal in the Order but declined in favor of remaining in Pfeildorf to continue his services as a priest. This would have been the end of Marius military career had he not awoken from a nightmare the next morning. He has never said a word of what transpired in his dream but it is rumored that Eric the young showed him a vision of what would come of a world without his intervention. Marius repaired the cart he had stood on his own, working in grim silence. eventually he brought out the shields of those who had fallen at his side and added them to the woodwork, naming it his "Shrine of the Fallen Saints" this wooden carriage has been pushed from one corner of the old world to the other by the men who defended Pfeildorf, and to this very day Marius can be heard giving sermons to his troops from on top the rickety structure. Wave of Steel and Iron Leader of the masses: Any army that has Marius as the general reverses the effect of "Sollanders" and "Crusaders". Meaning that any unit you take with the "Sollander" trait allows you to take a single "Crusader" unit of equal or less models. Crusader units may not be fielded otherwise. Roaring Constitution:Marius commands his men with his booming voice from afar. his men are never unable to hear his orders. Marius' Black monk bound spells; "For Solland! ", "Sigmar Protects You! ", "For Gerath! ", "For Death and Glory! ", as well as his Warcry, affect all units within 12" of Marius rather than a single unit. The Book of Solland: this book narrates all the great deeds of the men of Solland, it is her that Marius both recollects past deeds and writes in new ones as he preaches. Marius gets +1 on any attempts to cast Black monk bound spells. Pushed into Battle:The Shrine is deployed inside a single unit of "Order Soldiers". Place the shrine at the front of it's unit,as centrally as possible. Accordingly, the following rules apply. Moving the Shrine of the Fallen Saints: The unit the Shrine has joined marches, charges, and pursues normally so long as it has at least 10 models. For every model the unit drops below 8, the unit deducts 1" from its move. So, if there were 7 men in the unit, they would have a movement of 3, 6 would have a movement of 2, (etc.). If the unit is reduced to 4 or less models, it cannot move. Unbreakable, Large Target, Impact hits (d6) Blessing of the Righteous: The Shrine of the Fallen Saints gives Marius a sixth bound spell. "Epic Speech" Bound level 22, all units within 12" gain the "Righteous fury" special rule. Terrain: The shrine treats terrain as if it were a chariot. Exemplar guard: The Shrine muse be pushed by a unit of "Order Soldiers". This unit gains the "Sollander" trait and loses its "Crusader" trait. It also gains unbreakable but may never leave the Shrine of the Saints for any reason. Other characters may be deployed in this unit but may not leave the unit for any reason, nor may any character join the unit later in the game. Furthermore, the "Order Soldiers" in the unit are veterans of many battles. They may choose to increase their weapon skill by 1 for 1 point per model if they wish. The Shrine in combat: The Shrine does d6 impact hits when it charges, Marius may attack anyone in base contact with the Shrine. Enemy models in base contact may choose to attack the Shrine or Marius himself. Attacks against the Shrine must roll to hit as normal. The different sized base of the Shrine means some extrapolation must be done to work out the rank bonus. Count the model as the same number of Men that would normally occupy that space (usually 10) Destroying the Shrine If the Shrine itself is destroyed, remove the model and place Marius where it was. He will join the unit. This is the Only way Marius can leave the Shrine of the Fallen Saints. Special Rules: Immune to Psychology, Stubborn, Wave of Steel and Iron, Fear, Devastating Charge, Horned Dark Helms During the year 2330, The City-State of Ostland called it's Ritterbr端der Gradmaster: Order allies to aid in the cleansing of a new cult that had As the highest ranking Ritterbr端der, Augustrad was the arisen in the Provence, promised supplies and good payment chosen Grandmaster of the Order. Since his power was Augustrad, leader of the Ritterbr端der led a detachment of his abused this title no longer exists in the modern order. forces to seek out and squash this particularly evasive foe. Augustrad, and any unit of Demontiert Ritterbr端der he After leading a wild chase through Ostland, devastating joins, gains hatred against any unit that has one or more much of the countryside in the process, Augustrad drove the characters in it. Augustrad may also reroll attempts to cultists and their leader Oromus into Kislev. Having fulfilled wound if he directs his attacks against those characters. his duty Augustrad could have been paid well in compensation and could have left for home that very day... Sacker of Erengrad But Augustrad loathed to let a foe get the better of Kislev forces hate Augustrad (and his bodyguard if he him and so he continued his pursuit into the countryside of takes one) Kislev. Tracking the Cult to Erengrad he besieged the city with no warning, bringing down the mighty walls with nothing but a few well constructed trebuchets and a handful of elite knights at his command. Reaching the city center Augustrad personally saw to the execution of each and every cultist, as well as many of the citizens of Erengrad who where caught in the crossfire. Worse, his men went wild in the port sity, burning buildings, stealing merchandise of great 28 value and breaking many solemn vows of chastity in the sack. Arriving in the empire Rath began to enter contests of battle, winning each and every fight without a scratch on his body. The Order welcomed him back into their ranks with open arms and even offered to promote him to the rank of Marshal. Rath refused but continued joining crusades in an effort to find the man who had bested him in battle. Until he does, Rath is truly unstoppable on the field and battle and he carves through men like a hot knife threw butter. Special Rules: Immune to Psychology, Stubborn, Wave of Steel and Iron Fangrîr: The great longsword designed by Rath himself, designed to be effortlessly handed with perfected balance and a decapitating edge. capable of being wielded with either one or two hands and both equally deadly, this truly is a legendary sword. Fangrîr is a hand weapon. in addition it confers +1 to hit. Blademaster: The perfect swordsman, it is said, must be one with his blade, it must be an extension of his body and must never leave his hand. Rath has taken this ideal to the farthest extent, binding his very soul within his sword. Rath may parry even though he does not have a shield. In addition, each round of combat Rath participates in increases his adaption to his foe. Each round of a combat after the first, Rath gains +1 to the following stats cumulatively. WS, S, I, A. He also increases his chance to parry. on the second round of combat Rath's parry save becomes a 5+, on the third round a 4+ and so on. Rath was a fighter. He joined the order for the soul purpose of seeking out an opponent who could best him in battle. Eventually this did come to pass as during a battle in Ind he was defeated by a champion of their people. Taken prisoner, Rath managed to escape and he made his way across Ind back towards the new world. Along the way he met Tash'Timosen, a wandering Nipponease swordsman who he learned new arts and techniques from. As he came into the dwarf holds he forged for himself a new weapon named Fangrîr, "The gods Thumb" which was a mighty longsword that was lighter than most of it's size. Traveling next to Araby to attempt to find a ship to take him to Tilea where he would make his way into the empire. While there he encountered yet another master of blades who told him he must become one with his blade. Rath took a literal meaning to this and seeking out a sorcerer, had his soul transferred into Fangrîr. Decapitating Strike: Rath has worked long and hard at killing his foes with single elegant blows Rath has the killing blow rule. in addition, he may trade each set of 2 attacks for 1 attack with heroic killing blow. EX, Rath has 5 attacks in his 3rd round of combat. he may trade 4 of them for 2 attacks with the heroic killing blow rule. the Grand standard bearer from the Orders fortress in Ostland, Seth has born Solland's tattered Standard from one corner of the world to the other, defending his commanders and never retreating from a battle. A Flag for Every Occasion: Seth may choose one of the following banners to unfurl at the start of any battle that he takes part in. Unwavering: As Seth has fought in every War so has he endured. Should Seth's unit break, Seth is not removed as a casualty and his unit remains unbroken. Instead He is wounded for each point of combat resolution his unit looses by. He may take both armor and ward saves against these wounds. The Tower shield: The great tower shield that Seth created himself was a fantastic success and offers the greatest protection for a battle standard known to men. Seth adds 2 to his armor save against attacks in his front. (for a 3+ armor save) however the massive shield requires that he not fight while holding it. The Battle Standard of Pfeildorf: All units with the "Sollander" rule are considered to be in range of the Battle Standard for the purposes of re-rolling leadership tests. His unit also gains "Wave of Steel and Iron" even if they would not normally be able to have this rule. Nevros, Glorified Rider Nevros was never a dedicated knight like most of the Order. His father had been a mercenary hired under difficult circumstances to guard a Crusader fleet against pirates with his cadre of pegasus knights. However the Crusade never returned and neither did Nevros' father. Dedicating himself to either finding or avenging his maternal guardian, Nevros was taken by a passing Ritterbrüder under tutelage. Studying long and hard with daily if not hourly training exorcizes, Nevros became a strong and hardened man and an even tougher soldier. Graduating into the class of Halbruder was Nevros' first real achievement. Rarely was one so young admitted into their ranks but Nevros had proved himself by riding his pegasus with incredible skill. Taking it upon himself to train a new breed of knights for the Order, these “FliegenBruder” as they became known were a deadly combination of the Halbruders power and the speed and agility of pegasi. After being promoted for this act to the rank of Ritterbrüder, Nevros then left to join on a Crusade to Cathey who’s instruction was to raid and access strength. Upon getting there however, Nevros left the Crusade and looked for the last remaining evidence of his fathers demise. Arriving at the last battle of that ill-fated expedition, he found the remains of both Cathey and Nipponese troops, but the Orders men had been dragged away and properly buried by someone unknown. Finding his father amongst the dead gave Nevros a sense of fulfillment. He took his fathers armor and blade and returned home safely. He continued to train and grow the FliegenBruder into a true force to be reckoned with until his death came from a well placed Wood Elf arrow. It is said that sometimes his huge silhouette can be seen behind a massive charge of his beloved pegasus wing. Special Rules: Wave of Steel and Iron, Fear, Flying Cavalry, Horned Dark Helms, Devastating Charge, Blinding Charge: As the leader and founder of the FliegenBruder, Nevros led many a daring charge into masses of the enemy. He always had some form of luck the made the sun appear at his back... Any enemy units charged by Nevros are at -1 to hit for the duration of the first round of combat. CHOOSEING AN ARMY This army list enables you to turn your miniatures collection into an army ready for tabletop battle. As described in the Warhammer rulebook, the army list is divided into four sections: Characters (including Lords and Heroes), Core Units, Special Units and Rare Units. CHOOSING AN ARMY Every miniature in the Warhammer range has a points cost assigned to it. This reflects how effective the model is on the battlefield. For example, a Order Soldier costs just 6 points while a mighty Hochmeister costs 110 points! THE GENERAL An army must always include at least one Lord or Hero to be its General. Every army must have a General to lead it into battle. The General represents you on the field he issues the orders that lead to the moves, shots, spells and attacks that your troops make. Most of the time, both players choose armies to the same agreed points total. You can, of course, spend less points, and you may find it impossible to use up every last point. Most â&#x20AC;&#x2DC;2000 pointâ&#x20AC;&#x2122; armies, for example, will be something like1,998 or 1,999 points. MINIMUM THREE UNITS An army must always include at least three units in addition to any Lords and Heroes. An army just isn't an army unless it has plenty of warriors in its ranks. UNIT CATEGORIES Each army list divides the forces available into several categories. In a standard game, players are limited as to how many of their points can be spent from any particular category. To form your miniatures into an army, look up the relevant army list entry for the first troop type. This tells you the points cost to add each unit of models to your army and any options or upgrades the unit may have. Then select your next unit, calculate its points cost and so on until you reach the agreed points total. In addition to the points, there are other rules that govern which units you can include in your army, as detailed under Characters and Troops. LORDS You can spend up to 25% of your points on Lords. Lords are the most powerful characters in your army, individuals possessed of fearsome martial or magical might. ARMY LIST ENTRIES Profiles: The characteristic profiles for the model(s) in each unit is provided as a reminder. Where several profiles are required, these are also given even if they are optional. HEROES You can spend up to 25% of your points on Heroes. Heroes are lesser characters, not as intrinsically deadly as Lords, but still worth a score of ordinary warriors. Unit Sizes: Each entry specifies the minimum size for each unit, which is the smallest number if models needed to form the unit. In some cases, units may also have a maximum size. WIZARDS AND SPELL LORES Some Lords and Heroes are Wizards, and have access to one or more spell lores. Although you won't generate the spells that your Wizards know until you start to play your game you do need to make a note in your army roster of which spell lore each of your Wizards will use. If you have a Wizard that is allowed to choose specific spells, you must select which spells they are at the time you pick your army. Equipment: Each entry lists the standard weapons and armor for that unit type. The value of these items is included in the basic points value. Options: Each entry lists any available upgrades to the unit, together with their points cost. CORE UNITS You must spend a minimum of 25% of your points on Core units. Core units are the heart of your army, the iconic troops who make up the bulk of every warband and warhost. Unlike other types of unit, there is no maximum to the proportion of your points that you can spend on Core units. Special Rules: Many troops have special rules which are described in their relevant Bestiary entry With the points total agreed, players need to pick their forces using the army list in the relevant Warhammer Armies book, and the system presented here. Some Core units do not count towards the minimum points you must spend on Core units (sometimes written as 'do not count towards the minimum number of Core units you must include' or variations thereof) or indeed the minimum number of units you must include in your army. In fact, such units don't count towards any category, just the points value of the army. SPECIAL UNITS You can spend up to 50% of your points on Special units. Special units are invariably elite troops, capable of anchoring a battleline of lesser warriors, or performing great deeds in their own right. RARE UNITS You can spend up to 25% of your points on Rare units. Rare units are the most unusual warriors in your army, mighty monsters, weird war machines and elite soldiers of unsurpassed skill. Rare units are often fantastically powerful, but often require a canny general to get the most from them. Note that this limit applies to the basic troop type and isn't dependent on the size of the unit or optional war gear. Two Units For One Choice Some units are listed as taking up a single choice. As implied, this means that these two units count only as one choice. GRAND ARMY In a grand army, you can include up to 6 duplicate Special choices and 4 duplicate Rare choices. If choosing an army of 3,000 points or more, it is considered to be a 'grand' army, with enough patronage, cash or muscle to get a larger supply of scarce units: up to 6 duplicate Special choices, and up to 4 duplicate Rare choices. ARMY SELECTION SUMMARY TABLE You must always include at least three non-character units, plus one Lord or Hero to be your General. DUPLICATE CHOICES An army cannot contain more than 3 Special choices of the same type and 2 Rare choices of the same type. To further represent the scarce nature of Special and Rare choices there is a limit on how many duplicates of each troop type you can include in your army. This limit applies only to duplicate Special or Rare unit choices of the same type, not to the total number of Special and Rare units overall. If Augustrad is in your army then you may choose to upgrade a single unit of Demontiert Ritterbrüder to be his bodyguard for +2 point per model. This unit counts as a special choice, and Augustrad may not leave it at any time. Army Battle Standard One Marshal in the army may carry the Battle Standard for +25 points. The Marshal carrying the Battle Standard can have a magic banner (no points limit) but if he carries a magic banner he cannot carry any other magic items. Note: If the unit takes barding, they may not make use of their vanguard special rule. The Runefang of Solland is one of twelve blades forged by the dwarves for the Empire's Elector Counts. Lost to Gorbad Ironclaw at the battle of Solland's Crown, the blade was recently recovered and stored in the vaults of Altdorf. Sometimes a Hochmiester is permitted to wield the weapon in times of great need. Heavy Armor, All enemies striking the wearer are at -1 to hit. The armor of a great Skraling king was taken back to the armory of the order. It still holds the same frigged chill of the north inside of it. Stolen from the vaults of distant Khoromos the time sphere can cause a small rift in the space-time continuum. Men who would normally be restricted by the rules of the flow are suddenly let lose and the chaos this causes dismays those on the receiving end. (one use only) Must be activated at the start of the close combat phase. The bearer and any unit he has joined may fight in an additional close combat phase this turn. This â&#x20AC;&#x153;Secondâ&#x20AC;? close combat phase is resolved after all fights are completed that turn, resolve any combat involving the bearer and his unit. While you may overrun in this second phase you may only fight one close combat in this additional phase. Tyra has long since gotten used to dealing with cavalry from Bretonnia. Their warriors are renowned for being able to stand steadfast in the face of enemy cavalry. When engaged in close combat by an enemy cavalry or monstrous cavalry unit, the unit with the banner is stubborn. Troop Type Key: In = Infantry WB = War Beast Ca = Cavalry MI = Monstrous Infantry MB = Monstrous Beast MC = Monstrous Cavalry Mo = Monster Ch = Chariot Sw = Swarms Un = Unique WM = War Machine. The Order of Solland Once the crown jewel of the Empire, the province of Solland was destroyed by Orcs and it's people scattered to the wind. But they were not broken. Over the years Solland has rebuilt it's strength in the form of a knightly order, rallying troops from provinces earned through conquest and training some of the finest knights in the world. Let those who stand in the path of the Crusade be warned for like the incoming tide, they cannot be stopped. Inside you will find: A Bestiary describing every unit, monster, hero and war machine in your army. An army list to arrange your collection of miniatures into a battle-ready force.